While hailing the Sri Lankan national cricket team, President Mahinda Rajapaksa today said that 20 million people of Sri Lanka took a step back to allow 1.2 billion Indian people to enjoy some happiness, for the second time since 1983. 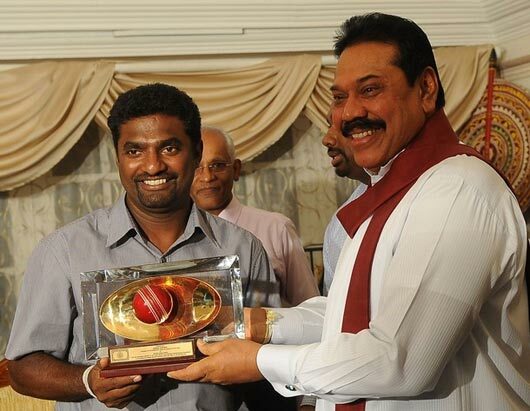 Rajapaksa, flanked by his wife Shiranthi, presented players with a 5,000 rupee gold coin and a pair of gold cufflinks encrusted with colouful stones, during a ceremony at Temple Trees, AFP reported. India won their first and only World Cup under Kapil Dev in 1983. Not only this time, the Sinhalese nation have been giving up 4 others joy since the past time. (once we gave up 4 prabhakarans joy in 30 yrs & so on..!) this must be stop now or nation will be ruined..! This is indeed, absolutely disgusting! The Vishwakeerthi has let corruption pervade every aspect of life. There are many who are frustrated including our sincere and talented cricketers. We are well into the making of a pariah state. Indian team was the better team. They deserved to win. They excelled in batting, bowling and fielding. It was shameful to watch the poor fielding and dropped catches of our team. Our highly paid foreign coaches have failed SL and the team in focusing to improve the fielding. If we are to be the Star of Asia in every field, including economy, we should stop taking the back seat. This sort of mentality has to stop. I did not expect our President to voice such a view. He should have rather accepted that India had the better team and that we should strive to be better in every field next time to win the world cup which is within our reach, provided we do not let corruption dominate. Our President should have called for a postmortem into the real reasons behind the scenes for the failure to win the cup and take stern action to prevent recurrence. Cricket is not a thing 4 us but tht’s an example of tht money has became the priority of this nation in every aspect. Common Good conduct & manners are nil 2day. Religious people also same. This’s the ruine i mean. Cricket is a religion 4 indians as they say. If so how’ll be the manners of them who’s religion is a playing.? but we’re not so, we’ve unique & good manners since before as a nation. This’s the deference of our behaviour which’s still in good than rest of the world. I saw in paper 2 day tht V.J.M. Minister has found a book which advices not 2 take ‘pan sil’ 4 people & he’s still studying 2 ban it. This’s the ruine i say. So MR has 2 be very strict & strong 2 stop bad conduct in the country. !